Media gateway communications protocol is used to implement a network element that provides conversion between the audio signals carried on telephone circuits and data packets carried over the Internet or over other packet networks. 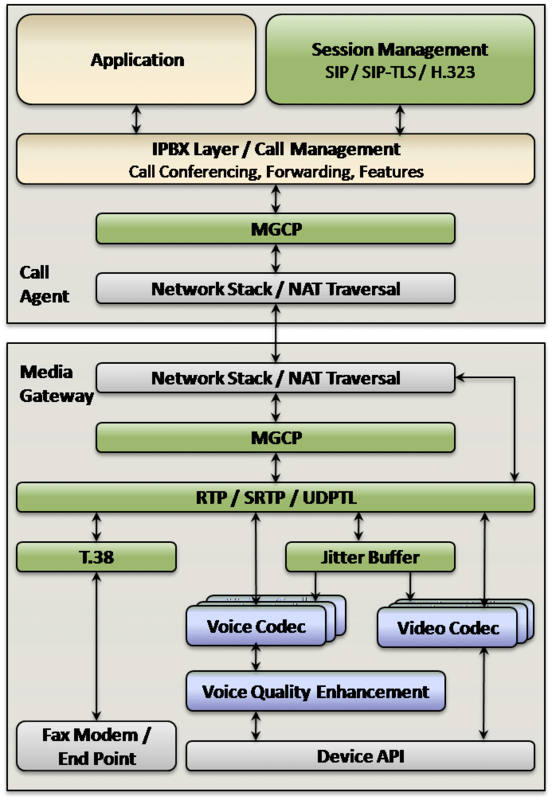 A decomposed multimedia gateway consists of a Call Agent, which contains the call control “intelligence”, and a media gateway which contains the media functions, e.g., conversion from TDM voice to Voice over IP. Contact us to discuss your media gateway application requirements. MGCP (Media Gateway Control Protocol) defines a protocol which can be used to manage the elements of a decomposed media gateway. Media gateways contain endpoints on which the Call Agent can create, modify and delete connections in order to establish and control media sessions with other multimedia endpoints. Also, the Call Agent can instruct the endpoints to detect certain events and generate signals. The endpoints automatically communicate changes in service state to the Call Agent. Furthermore, the Call Agent can audit endpoints as well as the connections on endpoints. MGCP assumes a call control architecture where the call control “intelligence” is outside the gateways and handled by external call control elements known as Call Agents. The MGCP assumes that these call control elements, or Call Agents, will synchronize with each other to send coherent commands and responses to the gateways under their control. If this assumption is violated, inconsistent behavior should be expected. MGCP does not define a mechanism for synchronizing Call Agents. MGCP is, in essence, a master/slave protocol, where the gateways are expected to execute commands sent by the Call Agents. MGCP protocol software can be extended with additional capabilities and exploited for many media applications. VOCAL’s embedded libraries include a complete range of ETSI / ITU / IEEE compliant algorithms, in addition to many other standard and proprietary algorithms. Our MGCP source code is optimized for execution on ANSI C and leading DSP architectures from TI, ADI, AMD, Intel, ARM, MIPS, and other vendors. The software libraries are modular and can be executed as a single task under a variety of operating systems or standalone with its own microkernel.